Our DECT phone solutions address communication needs for on-the-go workers in various industries, such as SOHO, warehousing, catering and retailing. The solutions include the W52P and the W56P for customers’ various technology needs and budget. Equipped with ECO technology and rich phone functions, the W52P ensures customers enjoy smooth and efficient wireless communications. 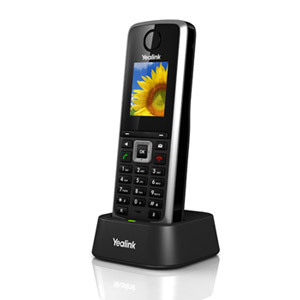 The upgraded W56P, the same great DECT phone model as the W52P, has a sleeker design, a better battery performance and improved functionalities, keeping busy workers “always online” with a pleasant user-experience. 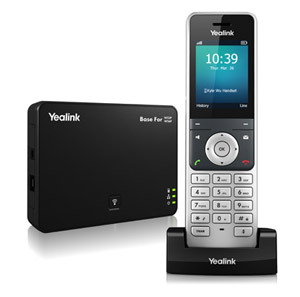 The Yealink W52P is a SIP Cordless Phone System designed for small business and SoHo that are looking for immediate cost saving but a scalable SIP-based mobile communications system. Combining the benefits of wireless communication with the rich business features of Voice over IP telephony, User can benefit from freedom of movement, lifelike voice communications, multi-tasking convenience, professional features like intercom, transfer, call forward, 3-way conferencing, PoE, etc. This system works with widely-known Broadsoft, Asterisk and 3CX, and it also supports quick and easy configuration. Featuring a big 2.4-inch colour screen, an elegant industrial design, excellent battery performance and other multiple usability and phone management upgrades, the W56P ensures busy workers can enjoy a pleasant user-experience and are always online. 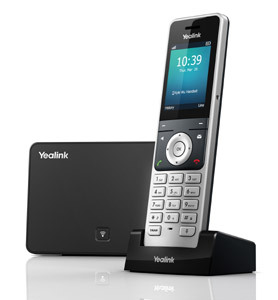 The Yealink W56P IP DECT Phone consists of one Base for W52P/W56P and one W56H Handset.